City and State you are located! Do you wish to Foster or Virtual Foster or Donate! 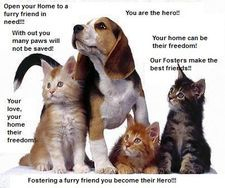 Fostering is one of the greatest things you can do to save a furry friend in need! Our fosters provide loving care, nutritional food, training, and protective homes for animals in need!!! Interested in fostering! Send us a message on the left and we can give you all the information you need! Without Fosters many animals do not see the true meaning of "Family!" Caninos Pet Salon is an excellent grooming facility that strives to care for your beloved pet and meet their individual needs using natural products. For the lowest prices and the absolute best selection, your only choice should be San Diego Pet Supply! Have an Item you wish to donate! Please let us know in the message box below! One of our Volunteers will get back to you as soon as possible to arrange Donation delivery or pick up! Will it need picked up by us?